Some introductory quotes. The decline in the knowledge of Winston Churchill by students. Some impressive facts about Sir Winston Churchill. The number of books still written each year about him. A quote from one of them. Some of his early accomplishments and history. Debunking some myths. A quote from his introduction to his speech to the Empire Club in 1929. Some history. The speaker’s organization - its membership and scope worldwide – and some of their activities. Why we study Sir Winston Churchill. More on his early years. Some anecdotes from Harrow. Some famous quotes. Churchill as author. Churchill as wit. Some interesting tidbits. His penchant for alcohol and what he said about it. His iconic cigar and “V” sign. Churchill as painter of landscapes. His last recorded statement. Don Cousens: Former Mayor, Town of Markham. I imagine that it would be a rare person who did not agree that Winston Churchill is a giant of history and someone who significantly altered the course of world events in a positive way. When I am looking for quotes, I have found Sir Winston to be one of the most quotable figures of history. Our speaker today, Randy Barber, is the President of the International Churchill Society, Canadian Chapter. The mission of the Churchill Society is to preserve and promote the accomplishments of Winston Churchill. Randy has a very eclectic biography, having such diverse experience as Chair of the Alcohol and Gaming Commission of Ontario from 1997 to 2005 and Ward Councillor of the Town of Markham from 1994 to 2000, where he earned the nickname “The Graffiti Fighter.” He was a Senior Account Executive with Callpro Canada Ltd. from 1982 to 1995, a sales manager with VMS Inc. from 1979 to 1982, and Director of Entertainment with the Commonwealth Holiday Inns of Canada from 1971 to 1979. He was also a banker in his early career as an Assistant Branch Manager with the Bank of Montreal from 1966 to 1971. Just last week he was appointed to the National Parole Board for a three-year term. Today he will be speaking on the life accomplishments of one of the world’s greatest citizens, Sir Winston Churchill. Please join me in welcoming Randy Barber. Madam President, head table guests, friends, ladies and gentlemen: Thank you for that kind, sincere and accurate introduction. As a “recovering politician,” I do appreciate it. As a matter of fact Madam President, it is most likely the second-best personal introduction I have ever heard. The only one better perhaps was at a speaking engagement a year or two ago when the fellow to introduce me fell ill at the last moment and I was forced to introduce myself! In 1960, a 16-year-old American high school student sent a letter through the post addressed simply to “The Greatest Man in the World.” The letter was delivered to 28 Hyde Park Gate in London, England. The resident of that address was Sir Winston Churchill. Today, many young people under 30 have no idea who Sir Winston Churchill was. A few years back, Winston Churchill Secondary School in Scarborough conducted a poll of its 1,000 students to see who could identify him. Some thought that he was the first principal of the school. Sadly, many could not even hazard a guess. Today’s heroes to youth—rock stars and basketball players—pale in comparison. Now my Empire Club blurb promised that I would shatter myths so the first one is that Churchill and his father Lord Randolph saved a boy who would become Sir Sanford Fleming, the discoverer of penicillin, from drowning in a bog in Ireland in the 1890s. This heart-warming fallacy has been circulating on the Internet for several years now—it is bunk!! As is the urban myth about Winston’s 125-year-old parrot that has been found in a bordello in Mexico City, swearing a blue streak with an English accent. The Churchills never owned a parrot, and even if they had, one of a long succession of Chartwell cats would likely have “de-perched” it!! There is probably no greater example of the right man, at the right place, at the right time, than Winston Churchill in 1940. He had warned against Hitler and Nazism from early times and he had advocated increased military and naval re-armament even when Britain was still recovering from the horrible trauma of the Great War. Churchill was 65 years old when he became Prime Minister on May 10, 1940. He had finally attained his lifelong goal proving true what was said of him in the early 1930s that “England will turn to Churchill when times become forlorn.” And it did! Today I am part of an organization with over 3,000 members throughout the world—the International Churchill Societies and the Churchill Centre, which celebrate Sir Winston’s enduring place in history and his relevance in today’s world. We publish a high-quality magazine—Finest Hour—four times a year; we republish books by Churchill that are worth $20,000 or more in their signed first editions; we support the work of Sir Martin Gilbert, his official biographer, who has published an eight-volume biography and is now working on the 16th volume of support documents for that biography. Indeed, on October 16 next, we will host the Canadian launch of Gilbert’s 79th book, “Churchill and the Jews,” at the Albany Club. Our patron, the Lady Soames LG DBE, née Mary Churchill, says of our work that we “keep the record accurate and the memory green.” My wife, Solveig and I, and 250 or so others, helped her celebrate her 85th birthday three weeks ago in Vancouver at the Societies 24th annual worldwide conference. I wrote to Lady Soames, enclosing a copy of her father’s address to this club some 78 years ago. 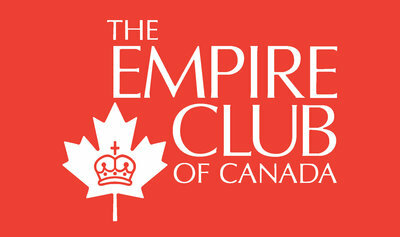 She has sent me a message of greeting to the Empire Club and to all of you. Soames letter was read. Well then, why DO we study Churchill’s life, his prescience, his faults and foibles? Churchill was really the last of his kind, a sentiment echoed by many a newspaper around the world, seemingly on a daily basis. He was a politician, statesman, orator, writer, historian, painter, bricklayer, prime minister and lover of books, cigars, Pol Roger champagne and French brandy, not to mention Johnnie Walker Black Label scotch. Winston Churchill was always satisfied with the best! In the following paragraph, an excerpt from the biography of the author of “Rumpole of the Bailey,” John Mortimer, “Clinging to the Wreckage,” Mortimer was reminiscing with his classmate Oliver of his time at Harrow in 1940, singing the old school songs: “Winston Churchill, then First Lord of the Admiralty, came down to this strange ceremony which he apparently enjoyed. After the school songs were over, Mr. Churchill climbed with difficulty on to the stage. He cannot have been more than 65 years old, but his ancient head emerged from the carapace of his dinner jacket like the hairless pâte of a tortoise, his old hand trembled on the handle of the walking stick, which supported him, and his voice when he spoke, was heavily slurred with brandy and old age. “He seemed to us as young men to be about 103.” Mortimer continued, “I whispered to Oliver, ‘If they ever put HIM in charge of the war, God, help us all!’” “Oh, they wouldn’t do that,” Oliver assured me. “They’ll never do that. A chap in the government told my ma they’d never do that.” How wrong he was and how fortunate for all of us too!!! •	A six-volume history of the Second World War. He said, “Writing a book is an adventure. To begin with, it is a toy, an amusement; then it becomes a mistress and then a master and then a tyrant.” How many of you know that, in 1953, Churchill received the greatest literary award in the western world, when he was honoured with the Nobel Prize for Literature for the totality of his literary contributions? United States President John Fitzgerald Kennedy also championed Churchill’s ability with words when, on the occasion of the singular honour of presenting an honorary citizenship of the United States to him, said that Churchill, during World War II “mobilized the English language and sent it into battle,” which was a “borrowed” quote from Edward R. Morrow. A few other tidbits of fact for you. He served under six British monarchs from Queen Victoria to Elizabeth the Second, and at the same time, 18 U.S. presidents from Ulysses S. Grant in 1873 to Lyndon Johnson in 1965, and 14 Canadian prime ministers from Sir John A. Macdonald to Lester B. Pearson. It is true that he knew and corresponded with virtually all of them concerning vital issues over the years that they shared the world’s stage with him. Field Marshall Montgomery, “I do not drink nor smoke and I am 100-per-cent fit. I too did not write his words; I only had the honour and pleasure to bring some of them to you today. I, of course, have nothing more to add and I thank you for celebrating some of Sir Winston’s rich life with me. The appreciation of the meeting was expressed by John C. Koopman, Partner, Spencer Stuart, and Past President, The Empire Club of Canada.